The process: before yoga, have healthy dinner at Japanese place near the studio. After finishing meal, realise wallet is at home. Apologise profusely to shy Japanese waitress, throw anything of meaning still in bag at her (driver's license, Amex) and hotfoot it home to get cash. Miss yoga. Almost run out of petrol. Drive back home totally un-zen and decide to bake cupcakes. Preheat oven to 170C. Sift flour, baking powder and salt. Cream the butter until pale, add the sugar and beat until incorporated and fluffy. Add eggs and continue mixing. Add vanilla extract, orange zest and juice/essence. Add milk and flour mixture in alternate amounts and beat on low speed until combined. Spoon into cupcake liners until 2/3 full. Bake for 17-20 minutes, until a cake tester comes out clean. For the frosting, beat the cream cheese and butter. Add the remaining ingredients and beat to combine. A drop of orange food colouring would look lovely. Refrigerate while the cupcakes cool, then pipe. Did something distract you before yoga last night, maybe before you left work? They look so good! Yum. hey - you pot the vanilla beans into the icing??? i'm doing a new falvour cupcakes tomorrow...banana and coconut icing. bit of an experiment....will report in! my question is...where do you find the time to do all these things??? i mean good on you. Sarah - I did with these. Usually you just put vanilla extract. Can't wait to hear about these, have wanted to do banana/coconut but not sure how the banana would work. D - I made these quite late at night! Plus cupcakes don't take long at all, really. I enjoy it, it's a bit of a wind down. 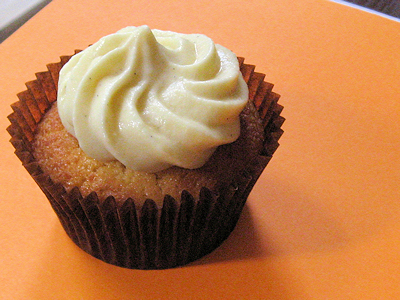 yeah - i'm surprised how quickly you can throw some cupcakes together...30minutes tops. I love the sound of these - yum!